Pop open the tube of Pillsbury™ Cinnamon Rolls with Icing. Remove packet of icing and set aside. Take the dough apart. Unroll the cinnamon rolls and spread 1 teaspoon of jam on the inside of each one, then carefully roll back up into shape. Join 2 rolls together to make 1 larger roll. Arrange on cookie sheets and bake according to package instructions. Remove from oven and spread icing over the top of each roll. 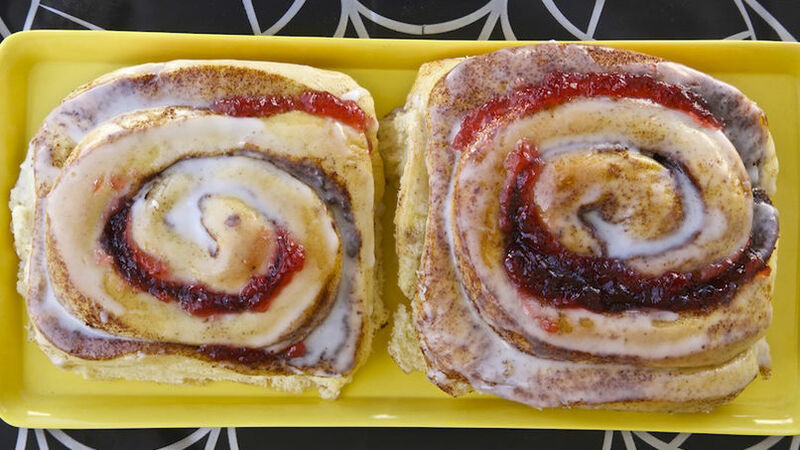 Dab a little more jam into the seams of buns. Serve and enjoy! Any type of jam can be used. Oozing cinnamon rolls are always my first dig at a Halloween haunt! As a baker, I'm always looking for easy, creative ways to change up recipes, like the traditional cinnamon roll. I've been whipping these up since junior high when I learned how to make them in home economics class. It’s as easy as opening a package of Pillsbury™ Cinnamon Rolls with Icing. Once open, I unroll the dough slightly and spread some raspberry or strawberry jam over the pastry before rolling it back up. I bake and frost, then add a little more jam to the top. One day as I was cutting them open with a knife, I realized that it looked as if the buns had blood on them. This spin on the cinnamon bun is a perfect fit for any Halloween party or as a snack to accompany a Friday night scary movie. Happy Halloween!